Flexibits is also the company that we've hired to develop a MacRumors iOS app which is currently in the works. This is the best part of the story! I'm sure I missed the announcement, but I'm ecstatic to see a MR app is in the works. Actually I'm starting to HATE this. Not because it's MacRumors, but a lot of sites are doing this, and why should I want 30-40 site-specific apps on my iPad to view information which is perfectly readable via the web? Some sites even have a banner advertising their app with either a fixed timeout (which means staring at it for 30 seconds) or with a tiny close-button in the top-right corner. Try it, in a moving train.. It's an annoying trend. I'd rather have a css for the device I'm using. ... a MacRumors iOS app which is currently in the works. Hate? Jeez. If you don't want the app, don't get the app. Good tip. But I will still hate it. I will probably put a picture of the icon on my wall, then smash it with a sledgehammer. Then log in to the web site. One of the first app purchases I made when I got my MBP. "Flexibits is also the company that we've hired to develop a MacRumors iOS app which is currently in the works." Arn, this should be a separate story. I think most people don't know about this. I'd love a MacRumors App, but is Apple going to approve an App that will consistently blow their trade secrets? That sounds like a deal too sweet to happen again. Who was offering it? http://www.productivemacs.com/ was offering it, along with BusyCal and a bunch of other great apps for $39 or $49 [LaunchBar, Default Folder X, Circus Ponies Notebook and 3 others - one of the best bundles I've seen]. It doesn't look like it jives well with Exchange, dang. This would be pretty handy. For $20 you'll probably never open iCal again. You'll also use it every day. So $20 divided by everyday equals a pretty good deal. I love it and don't regret purchasing it. I think $20 is still a lot of money for what amounts to essentially a menu bar applet. But the app is very useful and very well designed. I use it every day. 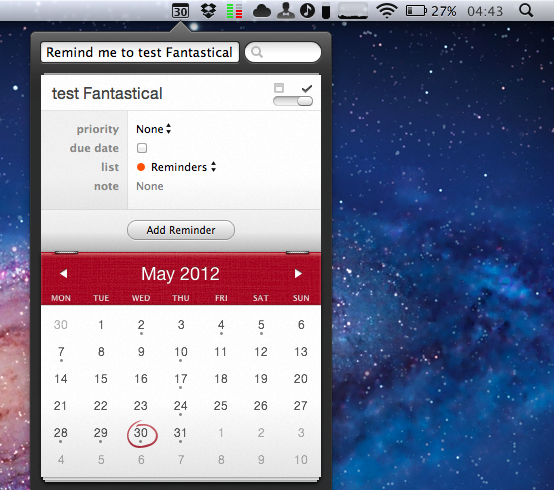 It is also worth noting that the developer is working on iOS version of Fantastical.